CAUTION: Do not attempt to observe the event described in this post without using approved eye protection. Sunglasses are not enough. The Sun’s light is intense, and contains ultraviolet radiation. That stuff will cause permanent damage to your vision. If you are not already an astronomer who understands proper filtering hardware, contact a local astronomy club for advice. Many clubs are hosting public viewing events using safe equipment. If you want to come up with something on your own, read some good advice at this website. On June 5th or 6th (depending on your location), the planet Venus will pass directly between the Sun and Earth. Venus will be visible as a black dot on the Sun’s disc, with a diameter about 1/30th that of the Sun. If you have proper eye protection, the event will be visible without using a telescope. The graphic above shows why these events, known as transits, are so rare. 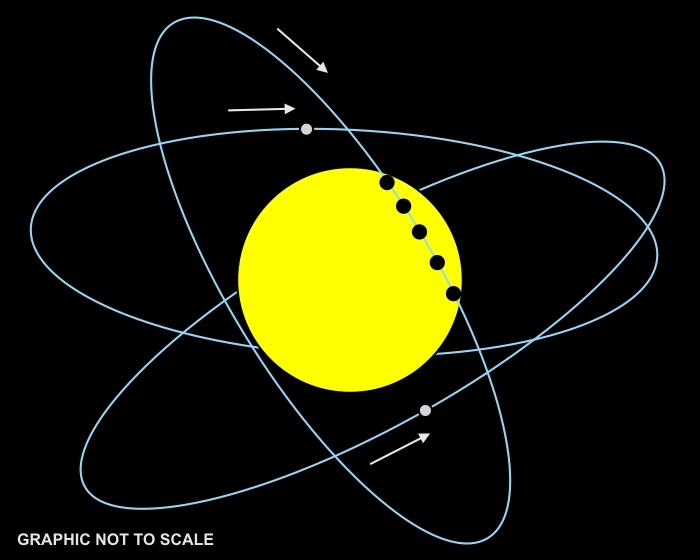 Venus orbits closer to the Sun than the Earth does. The orbital radius of Earth is 93 million miles. The orbital radius of Venus is 67 million miles. As a result, we can observe Venus occasionally pass in front of the Sun, silhouetted against the Sun’s bright disc. But the orbits of Venus and Earth do not lie in the same plane. The orbit of Venus is tilted by about 3.5° relative to Earth’s. And since they orbit the Sun with different speeds, Venus at 22 miles per second, Earth at 19, the orbit of Venus appears to tilt back and forth over a 7.0° range. The Sun appears only 0.5° in diameter, so there’s a lot more room to miss it than to transit it. Still, every so often, things line up just right. Twice every century, on average, we can observe a transit of Venus from most of the Earth. The two transits are really a “pair” that are separated by 8 years (due to geometric patterns). The last Venus transit was in 2004. The transit this week is the “pair.” After that, the next Venus transit pair will occur in 2117 and 2125. In Arizona, the event begins at 3:05 pm MST. For other locations, see the NASA/Goddard Space Flight Center. For help converting from GMT or UT time to your local time, see our Local Time & UT page. Venus is being followed by the SOHO (Solar and Heliospheric Observatory) satellite. For a real-time view of Venus as it approaches transit, click here. If you’re observing from Phoenix, AZ, as I will be, Venus will enter the Sun about 30° to the right of the Sun’s topmost point (as seen in the sky). The graphic above simulates Venus’ approximate path. The entire transit lasts 6 hours and 40 minutes, but the Sun will set in Arizona before the transit is over. Points farther west will be more fortunate, and be able to see the entire event. According to online maps, you’ll need to be as far west as China to earn that view. I’ll be shooting a video of the transit, so look for my results in Sky Lights. Give me a week or two. In the meantime, Google “June 2012 Venus transit” and you’ll find thousands of other astronomers’ results.